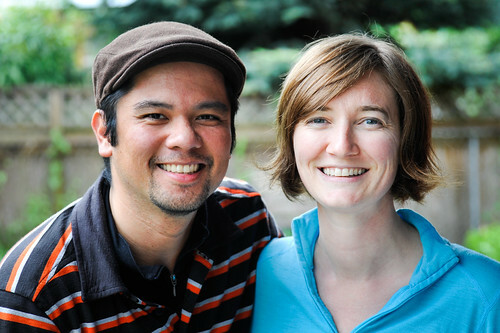 In this Rough Cut, we interview Jerry Norquist, the executive director of CycleOregon. 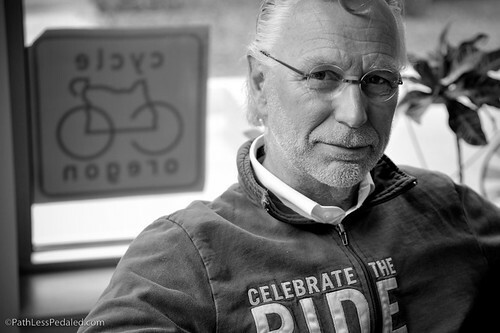 Jerry has been in the bicycling industry for many years and has been involved in bicycle advocacy throughout. In this video, Jerry talks a little about the history of CycleOregon, attending the National Bike Summit and the shift in conversation to promoting bicycles as an economic development tool. It has been enlightening to see how event rides can affect rural communities and can sometimes create long-term positive changes. On a personal note, we left Portland yesterday and took the Amtrak bus to Albany, OR. We are currently in Corvallis, OR staying with Laura’s mom for a few days while she heals. It looks like we will be in Oregon a while longer, doing short trips involving buses, trains and bikes (thank goodness for the Bromptons!). We’ve found that for a bike tourer in Oregon, there are many transit options to connect with a bicycle. We’re a little sad that we won’t be setting off across the country just yet, but we’re doing our best to turn the lemon into lemonade. 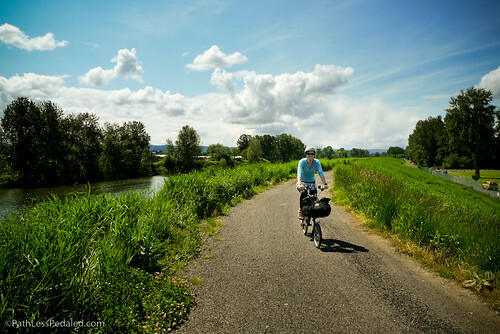 Staying in Oregon gives us a chance to really explore deeper into what organizations are making the chances to make Oregon more bicycle friendly and explore some of the rural communities that have embraced cycling. Part of the irony of our trip was when we first decided to do a tour combining bicycle and trains, the trains were an ancillary part of the experience, meant to augment and extend our bicycling range. Since Laura’s accident, trains and transit have taken a more central role in how we’re getting around. Likewise, having chosen the Brompton and the ease with which you can take it on trains, buses and cars has become key to our mobility. I hesitate to reduce what happened to a simple platitude like “all things happen for a reason,” but it has given us more perspective as to the importance of transit and bicycles. I’ve been a cyclist since ’71, A randonneur since ’85, a tourist since ’99 but just started Amtrak/bike adventures a few years ago. I bought an Asama folder which broke, then a Dahon. I’ve taken Amtrak to Montana to do the Going to the Sun loop; To Everett, WA to do the Snoqualamie rail trail; to Ohio to ride from SW to NE corners. To Vancouver, WA to ride to Vancouver BC. Friday I Amtrak to Kelso to do the Pac Coast/Sierra Cascades routes, back via Amtrak. Amtrak and bikes is a nice combination. We just need more bike hooks in baggage cars, like the Cascade. I like these rough cut interviews. Keep them coming. #1 is a bit like new technology, in that there are tiers of adoption. Imagine a bicycle utopia with bike lanes, locker rooms in every office building – those things would get more people riding. After a point everyone interested will purchase a bike. There’s likely greater profits in selling chains, tubes and services in the long run for local bike shops. In that example, commuters would divert their previous transportation expenses (gas, car tires, etc.) and direct it at cycling. Not sure if there’s a net gain to GNP from Uncle Sam’s perspective. #2 This is creating a new market, and is interesting. Call it a new form of tourism. It can divert *where* money is spent, which obviously has local consequences. GO! I love reading your blog! If you make your way down to the city of San Diego, I’d love to put you both up and offer some sort of financial support in having you create a visual similar to the one above about San Diego.